The French have come a long way from thinking Jerry Lewis was funny. This French film is fabulously funny. Laugh out loud funny. 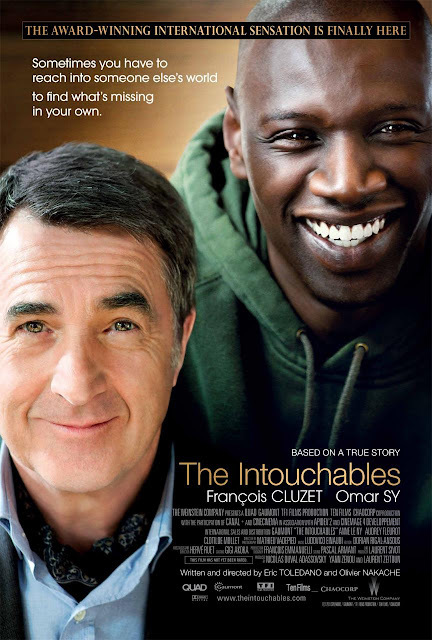 You wouldn't think that'd be the case when the film gives this as its brief synopsis: A true story of two men who should never have met — a quadriplegic aristocrat who was injured in a paragliding accident and a young man from the projects. 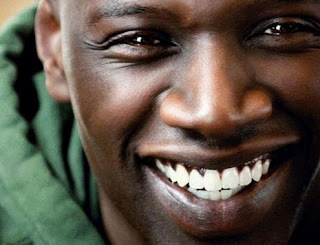 Omar Sy is not only the epitome of joy in this movie, but he's extremely easy on the eyes. His smiling face is now the wallpaper on my iPhone - it's a reminder to smile and know life is wonderful - not that I need the reminder. My mother's favorite part of the movie was the scene where he danced to Earth, Wind, and Fire's Boogie Wonderland. François Cluzet, playing the eccentric French aristocrat quadriplegic Philippe, is just as beautiful. His facial expressions, his primary acting instrument in this film, convey everything you need to know. And I love his laugh and smile. Sometimes you have to reach into someone else's world to find out what's missing in your own. 2007: Starting Soon. No, Really. The Intouchables did really well in DC. And I missed it! Thanks for the recommendation. Another movie that was around FOREVER: Monsieur Lazare. I watched the dance 3 times just now and I'm soaring as high as a happy jaybird...grrrreat movie! BELLEDOG: You must see it. Maybe it'll be coming to RedBox soon. I got it through Amazon Prime, since I'm a member. As for Monsieur Lazare, it's been on my Watchlist for a long time now and I can't wait to see it!